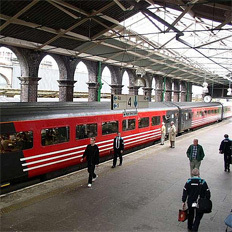 Trainhire.co.uk specialises in private train rentals for large groups as well as private luxury train travel in the UK and Europe. We offer low cost train travel for very large groups (of 100+ passengers) and can transport from 700 on a single train to over 3000 in a day. Separately, we can also book private carriages and private rail charters for smaller groups as well as VIP, hospitality, incentive and luxury train travel. We remove the complication from planning your travel. You'll have a single named contact for your private train rental who you can contact directly with any questions.